The Magic of Mary Poppins at the Bristol Hippodrome – review by Claire de Sully | Don't mention the M word! 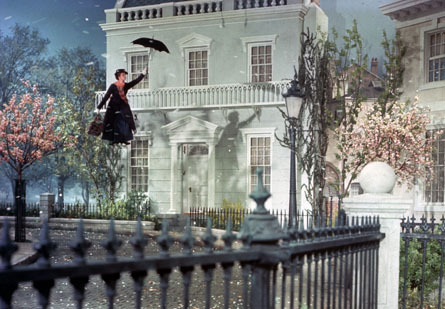 Upon learning that the Musical Mary Poppins was coming to Bristol, I felt an urge to go. The child in me and the child with me – my 7 year old – couldn’t resist the draw of this timelessly beautiful piece of cinema history transported into a magical theatrical dimension. Disney and Cameron Mackintosh announced earlier in the year that they were bringing back Mary Poppins – the West End show – last staged 11 years ago. Back then it ran for three years with more than 1,250 performances. The show has toured the world, being seen by more than 11 million people. The Bristol Hippodrome is made for shows like this. Designed by the renowned theatre architect, Frank Matcham, the Bristol Hippodrome opened in December 1912. It was Matcham’s last and perhaps most ambitious buildings, with a massive 5,000 square feet stage. Perfect for staging its first epic show: A Variety Bill headed by Eugene Stratton and a melodrama called ‘The Sands O’ Dee’ which featured an amazing water spectacular containing some 100,000 gallons of water and diving horses! The Bristol Hippodrome is a gem in Bristol’s art and culture crown. In recent years all the major West End productions, the Welsh National Opera, Sadler’s Wells Royal Ballet, and the London Festival Ballet have enjoyed successful seasons here. Mary Poppins allows us to enter the four walls of a family with complex issues. A father (Mr Banks) who lives to work, his wife suffers from having no sense of purpose or self-worth, their two children slip between them both to become quite unruly and dysfunctional. What they need is order and discipline from the hands of a nanny (according to the father). After a series of child care employment disasters, as if by magic, Mary Poppins appears to change (and turn) things around. This is a role that was defined by Julie Andrews. Anyone taking the part on is taking on a burden of comparison. A nod to this fact was referenced with the gruesome and feared nanny of Mr Banks’ childhood, being called Nanny Andrews. Zizi Strallen – as the leading lady – however does add something of her own to this role. Perhaps a more knowing, a bit more edgy Mary Poppins, added with spoonful of tremendous poise – which in itself generated much humour and rapport. Supported by an incredible cast the dancing and singing is of course of world-class standard. We would expect that at this level. What I didn’t expect was how something so magical on the screen could summon up such an immersive theatrical brilliance. It was as if the theatrical world of Mary Poppins was dancing all around you through clever projection, music, soundscape, lighting and ingenious set design by Bob Crowley. The theatrical tricks were incredible. Mary’s breathtaking up, up and away flight across the audience seemingly disappearing into the darkness of the auditorium celling. Another wow moment as Bert walks up the side of the stage and across the top (upside down) and back down again the other side. This feels real, real magic in front of your eyes, not just clever theatrics and wires. Equal stars of the show are Lighting Designer Natasha Katz along with Sound Designer Paul Groothuis, who bring the magic right up to your seat through seamless projection, lighting and sounds. The creative team assembled for Mary Poppins is impressive, including film director Richard Eyre. Co-direction and Choreography is by Matthew Bourne, with Co-choreography by Stephen Mear. A lush score by Richard M Sherman and Robert B Sherman underpins it all. So yes, this production went somewhere further than “practically perfect”. Roald Dahl’s once said: “Those who don’t believe in magic will never find it” and it was I who experienced magic watching Mary Poppins, along side my wide-eyed daughter, at the Bristol Hippodrome. Previous PostEris Quod SumNext PostIs Shepton Mallet on the cusp of losing an important piece of its history and a potential heritage and tourism asset?